Taupo Penthouse is a very spacious and luxuriously appointed apartment with modern interiors and furnishings. 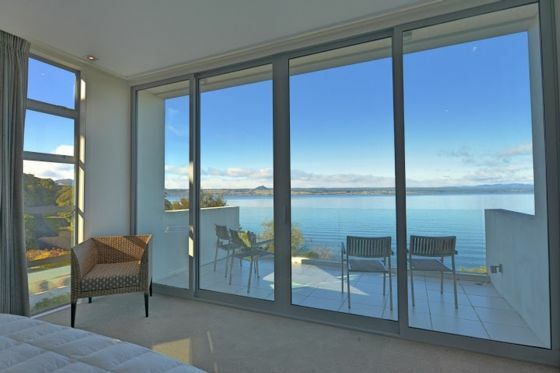 Featuring floor-to-ceiling glass doors which perfectly frame the unbeatable views of Lake Taupo. Modern, fresh and contemporary. From your arrival you will be impressed with the form and function of this apartment. Boasting under-floor heating and an ambient gas fire. The Kitchen is modern, roomy and a focal point of the living area. This is the perfect place for a special getaway with loved ones. Swipe card entry, direct lift access, indoor/ outdoor flow to decks and ample garaging. The Fourth floor roof top terrace and BBQ is the place to be. Lakeside bushwalks at your doorstep. Restaurants and cafes just up the road. The Taupo Village is just 7km away. This property was just as beautiful as the photos show! This property was just as beautiful as the photos show! We felt pretty special to have the opportunity to stay here. It was spacious and lovely to be able to enjoy all the beautiful views of Lake Taupo. Availability of toys and games for my 2 year old son was an unexpected treat. The apartment was easy to access from city center, but nicely tucked away from the busy part of town. A nice bonus to have laundry facilities available in the apartment. Heaps of space and great outlook. We were a party of 8 cousins who were getting away together for the very first time. We were a party of 8 cousins who were getting away together for the very first time. This property is absolutely stunning!!! Its modern, spacious, with incredible views. Bathrooms are luxurious with great shower pressure. Beds are super comfortable. Kitchen has everything a latge group needs and then some. Only downer would be the unfriendly people who live downstairs who complained to us about music within 30 mins of us being there when it was not very loud at all. Otherwise. ?? Lights in the kitchen above the cook top didnt work which made it very dark and the expelair dosnt work. The faucet in the kitchen is loose and needs fixing, as does the faucet on the shower in the main bathroom - it fell to the floor the first morning when we used it. Lighting in bathroom is very very dim (no good for applying makeup) so we could have used the mirrored area in the main bedroom - but unfortunately non of those lights are working either. Outstanding presentation and a great peaceful location. Outstanding presentation and a great peaceful location. We will defnitely be back.